Earlier this week there was a moderate earthquake along a strike-slip fault that appears to adjoin the Banda/Timor/Java Arc with New Guinea. This strike-slip fault appears to cross oblique to the subduction zone that forms the Timor Trench to the south and the Seram Trench to the north. Various researchers portray the faulting in this region differently. Given earthquake moment tensor and focal mechanism from the USGS, this earthquake supports the interpretation that this fault system is left-lateral (synistral) strike-slip. A focal mechanism from an earthquake in 1938 (magnitude M 8.5) provides evidence that is a little more confusing. But, this region is a complicated region. UPDATE: 2017.03.05 (23:00 local time): Interesting, I was reading my tweet after Lila Lisle noticed a mistake. I fixed that, but later realized that the possible fault in the downgoing plate is not the Sorog fault, but a fault that might intersect with the Sorong fault. I did not delete the tweet since this mistake is a topic of conversation and not really a key part of the story. Here is the USGS earthquake website for this M 5.5 earthquake. Here are the USGS websites for the major earthquakes in this region from the past century. I plot the seismicity from the past month, with color representing depth and diameter representing magnitude (see legend). I also include seismicity from 1917-2017 for earthquakes with magnitudes M ≥ 7.0. I show the fault plane solutions for some of these earthquakes. The fault plane solutions for the 1963, 1987, 2005, and 2012 earthquakes are all very similar to the 2017 M 5.5. However, these earthquakes are form two depth “populations.” The 1963 and 1987 earthquakes are at ~65 km depth, while the 2005, 2012, and 2017 are between 150-200 km. There are some earthquakes that are much shallower depth eastward along this possibly strike-slip fault. Near where this fault comes on land at the base of the Bird’s Head in New Guinea, there are some earthquakes from the past couple of decades that also have strike-slip fault–plane solutions. The earthquake depths along this Sorong fault (Hall, 2011) appear to show that the Sorong fault is active beneath the Sunda plate. The 1938 earthquake may be the result of some form of strain partitioned faulting(?). Alternatively, these earthquakes may be unrelated to the Sorong fault. There may be some internal structure in the Australia plate that is interacting with the subduction zones or other faults (some preexisting structure that is optimally oriented to reactivate with the . In the upper left corner is a general tectonic map for this part of the world. I placed a green star in the location of this M 5.5 earthquake (Zahirovic et al., 2014). In the upper right corner is a low-angle oblique view of the plate boundaries in the northern part of this region (Hall, 2011). The upper part of the diagram shows the opposing vergent subduction zones along that strike north-south along the Molucca Strait (Halmahera, Philippines). The lower panel shows the downgoing Australia plate along the Timor Trench and Seram Trench. Note the location of the Bird’s Head, the northwestern part of New Guinea. I have also labeled this region in the main map for comparison. The strike-slip fault at the northern boundary of New Guinea is the Sorong fault and this is labeled in this Hall (2011) figure. Below the Hall (2011) figure is a figure from Baldwin et al. (2012) that shows the regional seismicity and faulting as they are related to different geologic types in New Guinea. I placed a green star in the location of this M 5.5 earthquake. In the lower right corner is a part of the USGS Poster that reviews the seismicity of this region for the past century or so (Benz et a., 2011). The map shows seismicity with depth, along with some cross section locations. I place a green star at the location of this M 5.5 earthquake. I present three of the cross sections from this poster, A-A’, B-B’, and C-C.’ Of particular interest is the section B-B’ because this is placed near the M 5.5 earthquake. I have placed a green star that represents the hypocentral location on cross section B-B.’ The hypocentral depth suggests this M 5.5 earthquake is in the downgoing Australia plate slab. In the lower left corner is a diagram showing the subducting Australia plate at the Java Trench (Yves Descatoire). To the right of the Java Trench figure presents a detailed view of the faulting along the eastern Java and western Timor trenches (Hangesh and Whitney, 2016). They present evidence for oblique motion along the Timor trough. And present evidence for a backthrust on the northern side of Timor and the Indonesia islands east of Java. Here is the map from Benz et al. (2011). Tectonic maps of the New Guinea region. (a) Seismicity, volcanoes, and plate motion vectors. Plate motion vectors relative to the Australian plate are surface velocity models based on GPS data, fault slip rates, and earthquake focal mechanisms (UNAVCO, http://jules.unavco.org/Voyager/Earth). Earthquake data are sourced from the International Seismological Center EHB Bulletin (http://www.isc.ac.uk); data represent events from January 1994 through January 2009 with constrained focal depths. Background image is generated from http://www.geomapapp.org. Abbreviations: AB, Arafura Basin; AT, Aure Trough; AyT, Ayu Trough; BA, Banda arc; BSSL, Bismarck Sea seismic lineation; BH, Bird’s Head; BT, Banda Trench; BTFZ, Bewani-Torricelli fault zone; DD, Dayman Dome; DEI, D’Entrecasteaux Islands; FP, Fly Platform; GOP, Gulf of Papua; HP, Huon peninsula; LA, Louisiade Archipelago; LFZ, Lowlands fault zone; MaT, Manus Trench; ML, Mt. Lamington; MT, Mt. Trafalgar; MuT, Mussau Trough; MV, Mt. 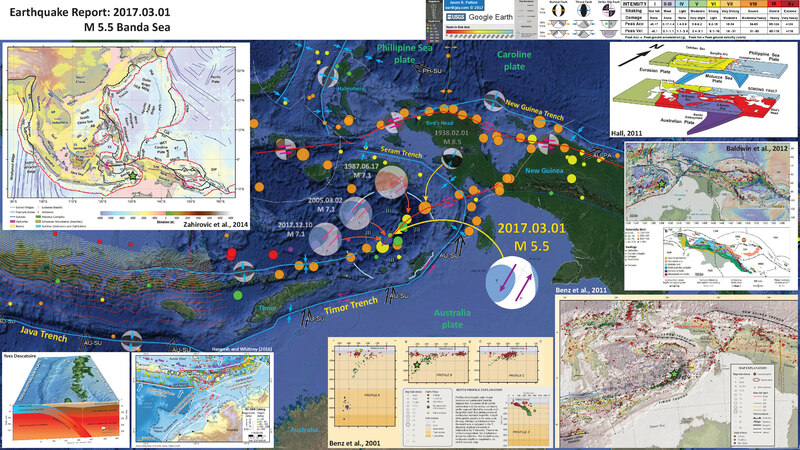 Victory; MTB, Mamberamo thrust belt; MVF, Managalase Plateau volcanic field; NBT, New Britain Trench; NBA, New Britain arc; NF, Nubara fault; NGT, New Guinea Trench; OJP, Ontong Java Plateau; OSF, Owen Stanley fault zone; PFTB, Papuan fold-and-thrust belt; PP, Papuan peninsula; PRi, Pocklington Rise; PT, Pocklington Trough; RMF, Ramu-Markham fault; SST, South Solomons Trench; SA, Solomon arc; SFZ, Sorong fault zone; ST, Seram Trench; TFZ, Tarera-Aiduna fault zone; TJ, AUS-WDKPAC triple junction; TL, Tasman line; TT, Trobriand Trough;WD, Weber Deep;WB, Woodlark Basin;WFTB, Western (Irian) fold-and-thrust belt; WR,Woodlark Rift; WRi, Woodlark Rise; WTB, Weyland thrust; YFZ, Yapen fault zone.White box indicates the location shown in Figure 3. (b) Map of plates, microplates, and tectonic blocks and elements of the New Guinea region. Tectonic elements modified after Hill & Hall (2003). Abbreviations: ADB, Adelbert block; AOB, April ultramafics; AUS, Australian plate; BHB, Bird’s Head block; CM, Cyclops Mountains; CWB, Cendrawasih block; CAR, Caroline microplate; EMD, Ertsberg Mining District; FA, Finisterre arc; IOB, Irian ophiolite belt; KBB, Kubor & Bena blocks (including Bena Bena terrane); LFTB, Lengguru fold-and-thrust belt; MA, Mapenduma anticline; MB, Mamberamo Basin block; MO, Marum ophiolite belt; MHS, Manus hotspot; NBS, North Bismarck plate; NGH, New Guinea highlands block; NNG, Northern New Guinea block; OKT, Ok Tedi mining district; PAC, Pacific plate; PIC, Porgera intrusive complex; PSP, Philippine Sea plate; PUB, Papuan Ultramafic Belt phiolite; SB, Sepik Basin block; SDB, Sunda block; SBS, South Bismarck plate; SIB, Solomon Islands block; WP, Wandamen p ninsula; WDK, Woodlark microplate; YQ, Yeleme quarries.